17/11/2017 at 4:06pm Alice Cooke Energy retail,	News,	British Gas,	Bulb,	Eon,	Spark Energy,	Centrica,	Electricity Retail,	Energy Retail,	Gas Retail,	Which? Some energy suppliers are leaving their customers on hold for up to 30 minutes, according to new research from Which?. The consumer watchdog made 768 phone calls to 33 energy companies to uncover the energy firms that answer their phones fastest, and those that keep customers waiting. The longest average wait to speak to a person was with Eon, at 14 minutes and 18 seconds, while the fastest was the green energy supplier Bulb, who answered, on average, in 27 seconds. 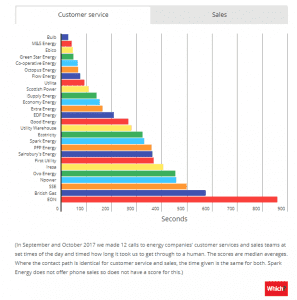 The biggest UK supplier, British Gas was the second slowest, with a time on hold of 9 minutes and 33 seconds, which is more than double the wait of 4 minutes and 14 seconds seen a year ago. Of the 26 firms, small supplier Spark Energy kept a researcher on hold for the longest time – more than 30 minutes. “It’s unacceptable that the worst performing energy suppliers keep their customers waiting on the phone for so long,” said the consumer group’s managing director of home services, Alex Neill.